Neighbors From Hell 2 is an Adventure and Casual game for PC published by Nordic Games in 2004. Make your neighbors angry so much! After you have succeeded in your job at the first version, You have traveled with your angry neighbors. You’re one a enjoyable vacation with them now. 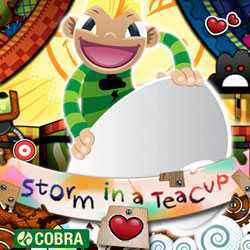 Storm in a Teacup is a Causal, Adventure and Platformer game for PC published by Cobra Mobile in 2012. Control Storm on his teacup! He wants to have an enjoyable adventure on his teacup. But there are lots of problems which may harm this little boy’s life badly.